Developed markets are the main spenders on healthcare i.e. over 75% of the global spend in 2017 while developing markets are forecast to increase their share from 25% in 2017 to 32% by 2020. Annual average growth in healthcare spending 2017-2025 is expected to value 4.9% in North America as in 2014, 48% of U.S. health care spending came from private funds, with 28% coming from households and 20% coming from private businesses. The federal government accounted for 28% of spending while state and local governments accounted for 17%. Most health care, even if publicly financed, is delivered privately and Canada spent 10.2% of their GDP on health care. Demand of smart healthcare is arising due to their ability to sense and diagnose complex situations as they are “predictive”, they have the capability to decide and help to decide as well as to interact with the environment. Energy autonomous and networked smart healthcare products are making the market critical in order to drive the developments in the field of medical technology, as they provide the basis for information-based care and cure. Goldstein Research analyst forecast the North America demand for smart healthcare products expected to generate revenue of USD 22.56 billion by 2025, at a CAGR of 5.1% over the forecast years due to large number of incoming small and medium-sized enterprises, along with constant market consolidation efforts by the more prominent players. The integration of microsensors and micro-actuators in products will provide the healthcare professional to better treat and take care of patients in the hospital and at home. The report covers the present ground scenario and the future growth prospects of the smart healthcare products market for 2017-2025 along with the data of shipments and adoption rate of smart healthcare products in North America. We calculated the market size and revenue share on the basis of revenue generated from major players across the region. The smart healthcare products market is forecasted on the basis of revenue analysis, product benchmarking and strategic developments of key market players. The report also includes micro and macro factors essential for the existing market players and new entrants along with detailed value chain analysis. Based on product type, electronic health record held the largest market share in North America smart healthcare products market in 2017 as this segment is envisaged to substantially increase the market share in forecast period owing to favorable government policies such as American Recovery and Reinvestment Act (ARRA). Telemedicine and mHealth is the fastest growing segment and projected to increase at the rate of 15.3% over the forecast period. North America Smart Healthcare Products Market Outlook 2017-2025, has been prepared based on an in-depth market analysis from industry experts. The report covers the competitive landscape and current position of major players in the North America Smart Healthcare Products market. The report also includes porter’s five force model, SWOT analysis, company profiling, business strategies of market players and their business models. North America Smart Healthcare Products market report also recognizes value chain analysis to understand the cost differentiation to provide competitive advantage to the existing and new entry players. 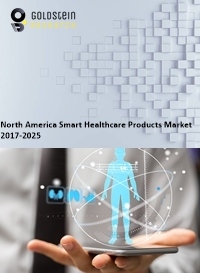 Our North America smart healthcare products market report comprises of the following companies as the key players: Invacare Corporation; Abbott, AirStrip Technologies, Agfa-Gevaert, Alcatel-Lucent, Apple, AT&T, AthenaHealth, Epic Systems, Evolent Health, F. Hoffmann-La Roche, Google, Honeywell Life Care Solutions, HP Enterprises Services, Huawei Technologies, IBM, Johnson and Johnson, Medtronic, Microsoft, Misfit, Olympus, OMRON, Proteus Digital Health, Qualcomm, Samsung Electronics, STANLEY Healthcare Solutions, Voxiva, Warby Parker, WellDoc, and Zebra Technologies. According to the report, major driving factor is the growing potential of new care models like healthcare security, remote care and transforming healthcare with IoT to improve security, privacy, interoperability, and analytics for medical devices. For instance, Intel technology innovation combined with advocacy and real-world experience with IoT across multiple industries is making the promise of smart and connected care a reality. Intel’s ecosystem healthcare solution providers are creating data-smart solutions to fight disease, streamline provider decision-making, and personalize treatment. Further, the report states the biggest challenge is security issues continue to deter smart healthcare product users coupled with decreasing operational costs, eliminating system errors, diseases management and better management of drugs are the key challenges that can hamper the smart healthcare product market. Based on geography, Epocrates, Medscape and MedCalc are used by doctors in US for being time-savers, speeding up the process of diagnosis, and limiting unnecessary doctor and hospital visits to cut down on taxing resources. With a rapid growth of human population and medical expenditure in US, mobile IoT healthcare becomes one of most significant issues for both individuals and governments. US dominated the North America smart healthcare products market with the market share of 67% in 2017 owing to multidisciplinary collaboration across industries and with multiple academic partners. While Canada acquired 33% of total North America smart healthcare product market attributed to smart system developments that are driving innovations in healthcare, enabled by microsystems- and nanotechnology, addressing today’s challenges. What is the revenue of total market in 2016-17 and what would be the expected demand over the forecast period?